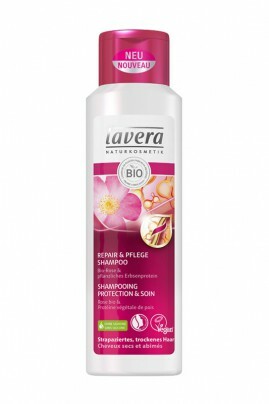 Shampoo Repair Care to bio Rose LAVERA smooth the hair structure and deeply hydrate. Thanks to its formula enriched with Organic Rose and Macadamia Bio Shampoo Dry Hair Lavera has a smoothing and corrective action on the hair fiber. Your hair is healthy and visibly more flexible than ever! Lavera grow their own products which are 100% natural and organic. Apply the shampoo Dry Hair Vegan Lavera wet hair. Lather and rinse with clear water. Feel free to complete your care Conditioner by Lavera Repair Care and the Care Repair Fluid Lavera tips for hair intensely hydrated! Déçue, ne m'hydrate pas assez le cheveux, ils redeviennent secs depuis ce champoing... Probablement due a la présence de sulfate rrrrrhh , je n'avais pas lu la compo avant mon achat j'aurai dû. 2 étoiles pour la divine odeur par contre, un délice.